Route 66 is often referred to as “The Mother Road,” but to us East Coasters it is Route 1. Sure, these decades, it’s the parallel I-95 we use to get anywhere fast, but One preceded it. It has been there since 1926 (or 1939, depending on how far south you live), and runs often at 35 to 45 mph, and under pseudonyms like Baltimore Pike, City Line Road, Boston Post Road, East and West Main Street. It stretches for 2376 miles, from Fort Kent, Maine to Key West, Florida. Up in Maine, lives D.C.-area native, Brad Richman. I, myself, have never lived, nor had close relatives live, very far at all from Route 1, except a couple forays up into the Hudson Valley. For four years in the Nineties I attended Bard College. This is where I met Brad, a photography major who was two years ahead of me in Stephen Shore’s program. I got to know him better when I made his portrait for my senior thesis, and I remember it like it was yesterday. The work was a labor of love, and Brad was living outside DC at the time, working a day job that forced him to travel away from home. But he made some peace with that and brought his view camera along with him to find courts and players everywhere he went, even very out-of-the way places. Some of my favorite pictures from this series are the Evans-esque ones of a country barn or a stucco building hung with a lonely basketball hoop, no kids in sight. Even though he was paying for materials on his own dime, the travel expenses were part of the gig he was already paid to do. He covered all of the lower 48 states during the basketball project - 28 of them paid for, and 20 of them self-financed. That last part reminded me of what the aforementioned Adams said to me about the digital world we live in. He said that had he grown up today, he would probably have been a painter or an architect, because he loved the darkroom so much, and now has no interest in digital technology. What would the photography world have been like without that man and his life’s work? Not the same. Richman may be in retirement from photography, but his pictures are not. 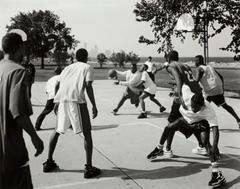 One of his photographs is currently in a show at the Art Institute of Chicago called "In The Vernacular." The photo is really taunting him, as it’s even reproduced on the cover of the show’s brochure, along with a picture by his old teacher, Stephen Shore. The show is up through May: http://www.artic.edu/aic/exhibitions/exhibition/vernacular . The basketball work can be seen at: www.bradrichman.com .